Bags of brightly wrapped holiday gifts line a walk at Long Lots School as even more are brought out of the biuilding to be shipped to two charitable organizations. The North Pole will have little on the Long Lots School this holiday season. 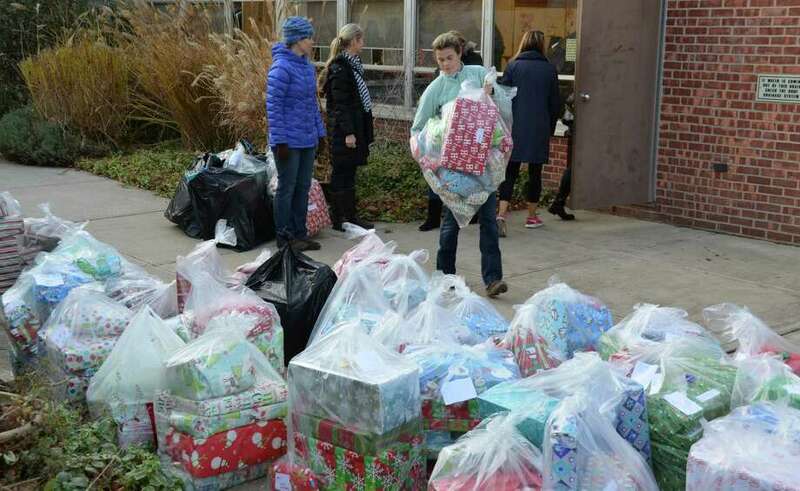 The elementary school's annual gift-giving program collected more than 500 gifts, plus $6,700 in cash donations, to brighten the holidays for needy families in Westport and Bridgeport, organizers said. The largess was to be distributed by the Westport Department of Human Services and the Evergreen Network, which supports Bridgeport children born to parents with AIDS or HIV. Gifts donated by students and their families ranged from necessities such toothbrushes and warm clothing to toys and games, the organizers said. Every Long Lots student participated in gift wrapping. Cash donations were to be used to purchase gift cards for family necessities such as groceries and gasoline, organizers said in a news release. The school's giving program is called "The Lion's Heart Program." This year, its generosity roared.